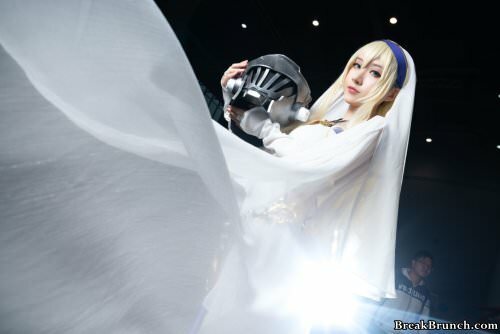 Sword Maiden is an beautiful blonde woman with a voluptuous body whose eyes are often covered with a blindfold. She wears white robes with blue outlines that slightly resembles Priestess’s main outfit and a golden decoration around her hip. Her body is covered in several faint white lines that have all mostly healed by the time the events of the story takes place. However, her eyes have healed to a lesser extent.